You’ll smell them before you see them, saccharine amongst the musty bowels of the earth, inviting beyond belief. 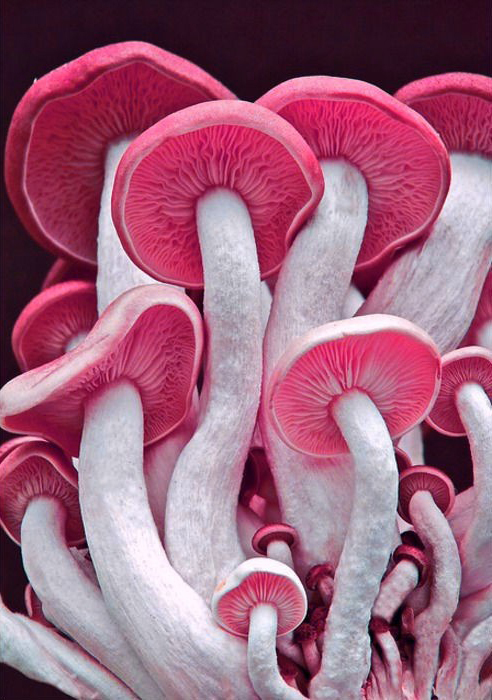 Despite the look of their lurid violet caps, marred with collapsed spots like a cancer, they are the most delicious thing you will ever eat while hidden away from the sun. Belly full, licking deliquescent honey spores from your fingers you’ll walk away without a second thought for the fruit offered up to you by the earth. Overnight the Honey-Veiled Recursive Webcap bears forth from your own skin in a violet splay of fruiting bodies. It does not itch, it does not burn, the fungus has grown to exist in harmonic mycorrhizal symbiosis with those that consume its fibrous flesh. As you bear it throughout the underworld dripping its honeyed spores it absorbs the nutrients it needs to survive not only from your body but by the things you inadvertently splash upon it, and in return provides you with a portable, infinitely renewable food source grown from your very flesh. After the 5th meal, save vs. Poison each time you gorge on the webcap. First Failure: Lack of carnage exhausts you. You don’t care for exploration and hidden secrets, gold has lost its sheen, you want contact with flesh, you want spilt blood. Insects crawl across your skin and you seem not to notice. Second Failure: Mycelial hyphae crowd your nervous system, touching your brainstem like nervous teenage fingers. The mushrooms provide everything you need, why would you want to eat anything else? The simple smell or vivid description of ordinary food and drink makes you retch. Third Failure: It’s difficult to see your skin for the fruiting bodies, they thrum together as you walk, creating sprays of tiny spore droplets that mist around you, it would be beautiful in a backlit slow-motion close-up. Fourth Failure: Your body is so riddled with mycelium it can hardly bear the strain of movement. You lack the strength to force flesh down the throats of your companions. And so you seek a cool, dank place to lie down, secret enough to avoid destruction, accessible enough for the fruit of your rotted remains to be stumbled upon by the next sporebearer. Your honey scent drifts on beneath the earth. That mushroom patch in the pic is horrid. Love it!